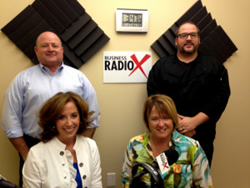 General Manager Susan Eaton spotlights Wilmington Convention Center on Wilmington Business Radio. The Hope Gala is a wonderful event that we enjoy hosting at the Convention Center. Wilmington’s Business RadioX will now have a special monthly episode hosted by the Wilmington Convention Center, spotlighting special events to be held in the Center. On the inaugural May 2, 2014 show, Ann Revell-Pechar co-hosted alongside Susan Eaton, General Manager of the Convention Center, highlighting the Juvenile Diabetes Research Foundation (JDRF) Hope Gala award recipients Scott and Twyla Satterfield. The Satterfields were joined in the studio by Wilmington Convention Center chef Scott Frazzetta. The Wilmington Convention Center is located in downtown Wilmington on the Cape Fear River. Its development began in the mid-2000s, and the organization has been attracting conventions and events since its opening. It is a boon to the region, as it brings tens of thousands of people to New Hanover County for events. As General Manager, Susan Eaton oversees day-to-day facility, food and beverage, and outdoor event space operations. This interview also featured the Convention Center’s head chef Scott Frazzetta. He has won awards for “Best in Show,” “Best Taste,” and “Best Appetizer” during the Epicurean Evening awards events. Frazzetta is closely involved in assuring guest delight during the JDRF Hope Gala, which will take place on Saturday, May 17, 2014 at the Wilmington Convention Center. To learn more about the Wilmington Convention Center, tune in to this episode of Wilmington Business Radio. The Convention Center’s shows will run the third Thursday of every month on Wilmington Business RadioX. Wilmington Business Radio airs on Business RadioX® each week, and gives voice to the most interesting thought leaders in the Wilmington, North Carolina business community. Hosted by Ann Revell-Pechar, owner of A. Revell Communications and Wilmington Business RadioX®, each episode appeals to the curious with fascinating interviews featuring out-of-the-ordinary guests. Wilmington Business Radio airs on Thursdays at 3:30pm EST at http://www.wilmington.businessradiox.com, and all episodes are available as podcasts for free download.